The Highlands Festival Singers is a mixed-voice choir of about sixty singers which is based in Haliburton, Ontario, Canada. The choir started in 1991 as a group that was put together specifically to perform Handel's Messiah. 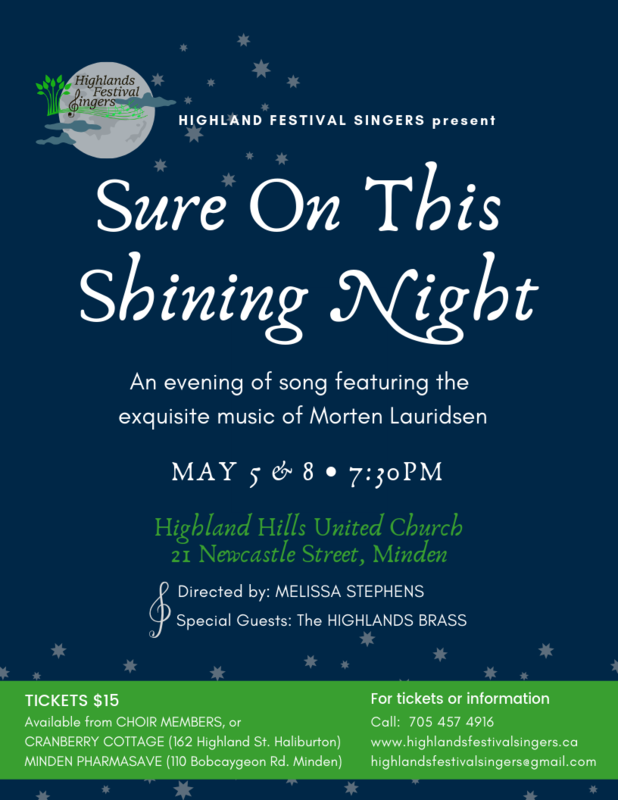 The original name the "Haliburton Messiah Choir" was changed to the "Highlands Festival Singers" in 2010 to reflect the more diverse nature of the arrangements that the choir now performs. The choir is under the musical direction of Melissa Stephens. Join the "Friends of the Highlands Festival Singers"
We'd like to invite you to join the Friends of the Highlands Festival Singers! A few times each season, we have concert-related information that we send out to our friends regarding dates, times, and locations. If you would like to be included for these notifications, please click here. Thank you!